Taking over downtown San Diego's waterfront Lane Field on Saturday, April 21 is the inaugural Mac & Cheese Beerfest, a craft beer festival and mac and cheese showcase. We are raffling off 2 VIP ticket and also offering promo code SDVILLE for $5 savings on any ticket type. Let's get gooey! 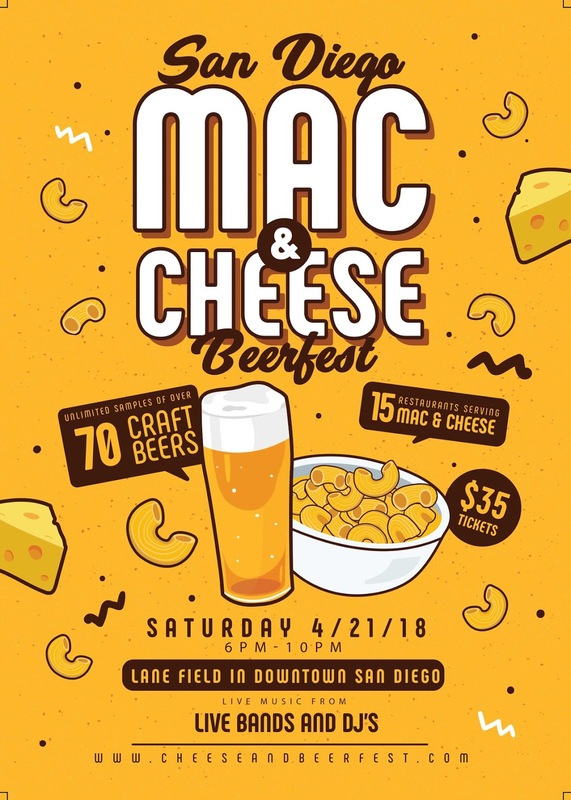 The Mac & Cheese Beer Festival, produced by Rock Star Beer, will be the perfect celebration of craft beer and everyone's favorite comfort food. The event is a walk around event held at night where guests have access to complimentary samples over 60 craft beers. There will be two stages of music from live bands and DJ's at this outdoor event overlooking San Diego Bay. ​Over 12 of the city's top chefs and restaurants are coming together to offer small size portions of their signature Mac and Cheese creations from $3-$5. 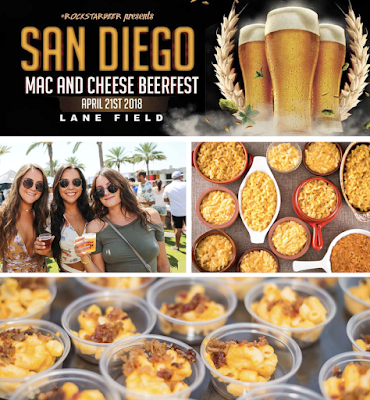 Participating restaurants include Mastiff Sausages, Bread + Cheese catering, Tavern+Bowl, Doggos Gus, Stacked, Red Wagon Pizza, Encontro North Park, Devil Dogs BBQ, Meat Locker, San Diego Sliders Co. and more. 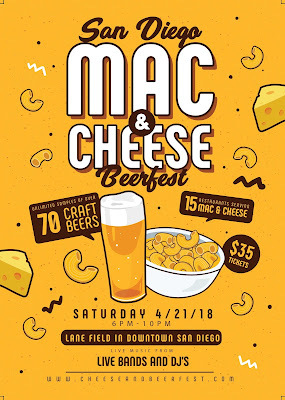 Tickets to the San Diego Mac & Cheese Craft Beer Festival are $35 for GA that includes admission from 7-10pm and unlimited craft beer samples and $50 for VIP, which includes early admission at 6pm with exclusive access to special brews. Be sure to enter promo code SDVILLE at checkout to save $5 per ticket. Lane Field is located at 900 Broadway in Downtown San Diego. For more information and to purchase tickets, visit cheeseandbeerfest.com.